Haq's Musings: Can Pakistani Military Defeat Taliban? On Thursday, Pakistan's Prime Minister Yousaf Raza Gilani declared in a televised national address that the Pakistani government would pursue no further peace deals with the Pakistani Taliban but was rather dedicated to eliminating them and reasserting national writ in the northwest of the country. The speech marked a major shift in policy for the Pakistani government, which has fought militants in the Pushtun areas off and on for years. President Pervez Musharraf was the first to attempt to conclude a truce with them, in 2006. A similar truce was proposed for the Swat Valley by the provincial government of the North-West Frontier Province, dominated by a Pushtun nationalist party earlier this year, but has decisively broken down over the expansionism of the guerrillas, who attempted to expand their territory from Swat into nearby Buner. Given the history of insurgencies in different parts of the world and various nations' abilities of dealing with them, are there any parallels in nature as far as human body's reaction to internal biological strife goes? As I pondered this question, I was struck by the relevance of the recent research on how the flu affects different people differently. 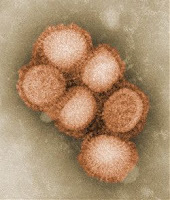 Why do some people infected with the influenza virus have symptoms resembling an ordinary cold, while other people infected with the same virus may get very sick or even die? Writing in the Journal of Leukocyte Biology, a group of researchers say they now have a better understanding of some of the factors involved in the severity of influenza infections. In an infected person, they say, the virus can sometimes temporarily paralyze the immune system, making that person more vulnerable to other, more deadly infections. As the human body senses the presence of the flu virus, its immune system kicks in to deal with the insurgent virus. The body produces Interferon which interferes with the replication and growth of the virus, and alerts the T-cells (killer cells) to engage with and kill the virus. These T-cells also kill the healthy tissue and cells along with the diseased tissue. The dead cells are then coughed up and removed from the body. In most cases, the human immune system handles the infections and people get well quickly. But sometimes, the body overreacts with too many killer T-cells attacking the virus and paralyze our body's immune system, exposing us to various other infections, including deadly forms of bacterial infections. Children and elderly patients often fare worse because their immune systems are either not well developed enough or too weak to fight infections. 1. Pakistan needs an interferon strategy to disrupt the growth of Talibanization in Pakistan. With international help, such a strategy should rely on extensive use of soft power that creates economic incentives for young men to stay away from the Taliban. Beyond the efforts to create and fund reconstruction opportunity zones (ROZ) in FATA which are desirable and welcome, what is really needed is an international Marshall Plan style effort toward transforming Pakistan from a feudal/tribal to an industrial society which can employ its growing young population. Pakistan's President Zardari has called for such a Marshall Plan for Pakistan. Such an effort will face major hurdles from Zardari's own party and its corrupt feudal leadership. However, if it is successfully implemented to respond to mounting pressure by the Taliban, new opportunities will open up for the nation's young population to offer them better alternatives to joining Jihadi outfits or seeking work in countries like Saudi Arabia where they are further radicalized. 2. The use of military force, the equivalent of the killer T-cells in the body, to respond to Pakistan's Taliban insurgency needs to be carefully calibrated to do the job effectively. These soldiers (T-cells) must minimize the death of innocent civilians (healthy cells) or collateral damage. Too little force will not stop the insurgents. But too much force can create a powerful backlash against the military's efforts and become counterproductive. Open and continuing pronouncements by the United States officials on the situation in Pakistan and the ongoing US predator attacks will inflame opinion against Pakistani government. Watching public opinion in Pakistan is the key to success for all parties involved in bringing peace and stability to Pakistan. With Taliban's recent well-publicized excesses in Swat, Pakistan public opinion has begun to turn against the Taliban. But public opinion is fickle and it can change again. While it is understandable that there will be refugees who must be well cared for, the Pakistani public opinion will shift against Pakistani government if the military is seen as displacing or killing large numbers of innocent civilians caught in the battle, or the US continues its drone attacks that end up killing innocent civilians. There is a lot of sensitivity required during the counterinsurgency operations. Well, India has not be particularly successful in the face of Indian insurgencies not comparable to the Taliban insurgency. The Taliban insurgents are well-trained and well-armed. They(then called Mujahedeen) defeated a superpower called the Soviet Union and now they are giving an extremely difficult time to US and NATO. While India has abandoned the fight against the Maoists who rule large swaths of land in half of India's provinces, it has maintained 500,000 troops in Kashmir for decades and still deploys them, costing India lots of money and tremendous hostility of the Kashmiris. Two-thirds of India's 2009 budget is allocated defense, security, police and debt service. This is a country with the largest number of poor and hungry people with the lowest access to sanitation and public health facilities. So the only thing Pakistan can learn from India is what not to do in counterinsurgency. So the only thing Pakistan can learn from India is what not to do in counterinsurgency.Yes, the Pakistani Army has a playbook all its own. Wonder why the rest of the world doesn't learn from the spectacular counter-insurgency successes of the Armed Forces in Balochistan, N and S Waziristan - Swat and surroundings of course. They swing from craven surrender - oops, sorry, peace deals - to blasting with jets and gunships. Either way - no boots on the ground. Anon: "Either way - no boots on the ground." This false statement says it all about your deep knowledge of what's going on in Pakistan. While you are quick to assess and criticize, you have still not enlightened me with your thoughts on what Pak can learn from Indian counterinsurgency experience....short of deploying 500,000 troops for decades. you have still not enlightened me with your thoughts on what Pak can learn from Indian counterinsurgency experience....short of deploying 500,000 troops for decades. Pak can learn nothing. But Indian counter-insurgency is not holding back the tide as Pak's is. Fail this counter-insurgency test, and Pakistan will rip itself apart. At least Gilani, Sharif and Zardari are claiming this. 15000 FC troops does not constitute "boots on the ground". These are the same weasels who previously surrendered without a shot fired. The poor suckers are caught between a rock and a hard place. And so, the chest-thumping bravado of aerial bombardment. Apart from driving a million people from their homes and killing giant amounts of livestock, it's a lot of noise with nothing to show for it. And the 500000 troops you mention - well, it worked. It's held the Pakistani army and its jihadi affiliates at bay militarily while the politicians got their act together. Now those endearing affiliates have gone rogue. It started with Lal Masjid. Swat will cause blowback that the men of straw running Pakistan are not up to handling. India needs to gear up for the 8-figure refugee toll coming in relatively short order. The 500, 000 troop solution has cost tremendously to a poor country like India....its number of poor and hungry has grown since the early 90s. It is unsustainable and it has not worked. Kashmiris will not be cowed down for long. It will not work in Pakistan, either. Pakistan needs the two-pronged strategy I have suggested ...1. Disrupt the growth of Taliban virus with soft power with international help and 2. Defeat those who insist on fighting with appropriately calibrated force response. There is difference between arrogance and idiotic sense and insane thinking. While religion has made us insane,hatred against hindus has made us idiots. Kashmir should be left to decide for itself.Anyways, its funny seeing how you are tackling these clever guys who are provoking you. Personally it is hard to answer some of these guys questions as they make me think which Pakistan I belong to?The one ruled by Zardari or the one by army or the one by Taliban.I would like to see what your thoughts are on this? I definitely do not want to think Zardari as ruler while army should not guide us. Anon: "..The one ruled by Zardari or the one by army or the one by Taliban.I would like to see what your thoughts are on this?" I think we need to differentiate between individuals, groups and the nation as a whole. We should wish the best for the nation and do what we can to help Pakistan regardless of who is in charge. Gen (retired) Pervez Musharraf, in his autobiography, had alleged that Omar Saeed was an agent of MI6, the British intelligence agency. Omar Saeed Sheikh, a detained Pakistani militant, had made hoax calls to President Asif Ali Zardari and the Chief of Army Staff, Gen Ashfaq Parvez Kayani, in a bid to heighten Pakistan-India tensions after last year’s terrorist attacks on Mumbai, investigators have told Dawn. ‘Omar Saeed Sheikh was the hoax caller. It was he who threatened the civilian and military leaderships of Pakistan over telephone. And he did so from inside Hyderabad jail,’ investigators said. The controversy came to light after Dawn broke the story, exactly one year ago, that a hoax caller claiming to be then Indian foreign minister Pranab Mukherjee was making threatening calls to President Zardari. It was on the night of Nov 26 last year that Saadia Omar, Omar Sheikh’s wife, informed him about the carnage in Mumbai. The sources said that the information was passed on to Omar in Hyderabad jail through his mobile phone, which he was secretly using without the knowledge of the administration. All but one of the attackers who India alleged were Lashkar-i-Taiba terrorists were shot dead by security personnel. Saadia kept updating Omar about the massacre through the night and small hours of the morning. On the night of Nov 28, when the authorities had regained control over the better part of the city, Omar Saeed, using a UK-registered mobile SIM, made a phone call to Indian External Affairs Minister Pranab Mukherjee. He told an operator handling Mr Mukherjee’s calls that he was the President of Pakistan. Indian officials started verification as part of security precautions and, after some time, the operator informed Omar Saeed (who was posing to be Pakistan’s president) that the foreign minister would get in touch with him soon. Omar now made a call to President Asif Ali Zardari and then the Chief of Army Staff. He also made an attempt to talk to the US secretary of state, but security checks barred his way. The presidency swung into action soon after Mr Zardari’s conversation with the adventurous militant. President Zardari first spoke to Prime Minister Gilani and informed him about the happenings. He also took Interior Minister Rehman Malik into the loop. In Rawalpindi, Gen Kayani immediately spoke to the chief of the Inter Services Intelligence, Lt- Gen Ahmed Shuja Pasha. According to sources, not only President Asif Zardari was taken in by Omar’s audacity but the COAS was also baffled by his cheekiness. Gen Kayani, sharing his thoughts with close associates, said he had been bewildered by the caller’s threatening tone. INVESTIGATIONS: On the other hand, investigators got into the act without wasting time, coming up with their findings within hours. Their conclusion was that the phone call which came from the Indian external affairs ministry was actually their (Indians’) check. They said the calls to President Zardari and the army chief were made from a Britain-registered SIM. LONDON, UK—Beating hundreds of soldiers from major armies of the world, Pakistan Army has won the coveted Gold Award at the prestigious Cambrian Patrol Exercise held in Wales with participation from armies of India, Australia, Canada, United States and France among others. 750 soldiers from across the world descended on the Brecon Beacons in Wales to suffer through one of the toughest exercises ever devised. The Cambrian patrol tested the soldiering skills of the teams as they crossed some of the most arduous terrain one can imagine. During the marches, the teams had to complete challenges including observation and reconnaissance of enemy forces, cold-river crossings in full kit without access to boats, first-aid and defensive shooting under attack. The exercise is organized by the British Army [HQ 160 (W) Brigade on behalf of HQ 5 Div] with an aim to provide a challenging patrols exercise in order to develop operational capability. Cambrian Patrol is arduous and concentrates on leadership, teamwork, physical fitness and achieving the mission by drawing participants from foreign countries. The corps commander said that Pakistan Army has conducted more than 300 major and 760 minor operations in militancy-hit areas in the last few years, most of them in the year 2009-10. He added that peace has been restored in entire north of Pakistan and road accesses to majority of Fata have been established. From the year 2008 to 2012, writ of government has been established in 91 per cent of Fata while eight per cent remain in contested control. Army is working on the sustainable development plan in order to improve the livelihood condition of ordinary people in Fata, he added. The Commander mentioned 52 ongoing educational projects under Pak Army especially the establishment of Cadet College in South Waziristan Agency, Khyber Institute of Technical Education and Waziristan Institute of Technical education as a major development in improving skill and quality education among people of Fata. Gen Rabbani categorically stated that no army in the world can win war without the support of its countrymen. He described political ownership of military operation and operation within tribal system as the way forward in achieving long lasting peace in Pakistani militancy hit areas. He termed gradual mainstreaming of Fata and its infrastructure development as key towards its socio economic development. Replying to a question raised by a student, Rabbani said that army remains in a particular area for attaining pace on requisition of the federal government. He also rejected the perception that army consumes eighty percent of the budget, and explained that all the three forces i.e. Army, Air force and Navy consume 17 per cent of the total budget, in which army share is 8.7 per cent. He stressed the need for perception management of the country and described Pakistani media as key partner in achieving it. The seminar is a sign of solidarity with our army who are sacrificing their lives for peace within the country, said Prof Dr AZ Hilali, Chairman Department of Political Science. He said that department of political science has been arranging series of national and international seminars on core issues confronting the country and the region for capacity building of the students. Hazrat Gul spent two years in detention for allegedly aiding the Pakistani Taliban when they publicly flogged and beheaded people during a reign of terror in the scenic Swat Valley. Now he wiles away his time in pristine classrooms, a Pakistani flag pin on his crisp uniform, learning about word processing, carpentry and car repairs at the Mashal de-radicalisation centre run by the army. Part of a carrot and stick approach to battling militancy in the strategic U.S. ally, the aim is to cleanse minds of extremist thoughts through vocational training, and turn men like Gul into productive citizens who support the state. The success of the programme will ultimately hinge, however, on the the ability of the government, widely seen as incompetent and corrupt, to help the de-radicalisation graduates find jobs. Pakistan’s military drove militants out of Swat in 2009. Mashal is in the building which used to be the headquarters of the militants from where they imposed there austere version of Islam. Eventually, the army realised it couldn’t secure long-term peace with bullets alone. So military officers, trainers, moderate clerics and psychologists were chosen to run three-month courses designed to erase “radical thoughts” of those accused of aiding the Taliban. Students like Mohammad Inam, 28, a former assistant engineer, give the school a good report card. School officials say about 1,000 people have graduated since the initiative began two years ago, and that only 10 percent were not cleared for release. Officials concede that their “students” are not hardened militants who killed. Mostly, they provided the Taliban with water, food or shelter, or beat people. Outside Mashal’s classroom, there are signs that not everyone is embracing the new approach. Soldiers led a hooded man into a truck while three others looked on through the barred windows of what appeared to be a cell at the compound. Conditions still seem ripe for Fazlulah and his lieutenants, who have vowed to make a comeback, to recruit people. Pakistani officials estimated after the army operation expelled the Taliban that over $1 billion would be needed to revive the local economy and rebuild infrastructure. Residents like Ajab Noor, 61, who sent two of his sons abroad to work, doubt the population of about 1.3 million will ever benefit from those funds. “People have no options. They either go outside the country to work, or they join militants who promise them many things,” he said at a street market in Swat’s capital, Mingora. A member of a state-backed anti-Taliban militia believes two boys in his village had graduated from a de-radicalisation centre and ran away to rejoin the Taliban. “I told the military, ‘you are nurturing the offspring of snakes’. But they did not listen,” he said. Qadeem is a political scientist who left academia several years ago to found an organization she called PAIMAN - meaning promise. It focuses on young men who are vulnerable to militancy, especially the enticement of being paid to fight. Mossarat Qadeem is in Washington, D.C. this week, leading a delegation of women activists from Pakistan, meeting with congressmen, aid agencies and civil society organizations. She joined us in our studio. MONTAGNE: How much influence do mothers have over their sons when it comes to their sons being vulnerable to radicalization, extremism? QADEEM: In Pashtun society, a women - and particularly a madam - is very well-respected. And people - like the sons - they do listen to the mothers. But age is also very important, because I - we only work with the age group of 14 to 21, 22. That means they're influenced very easily and quickly outside where they can be influenced inside the house, as well, very easily. And once a mother is convinced, I think, you convince the whole family, the whole community then. MONTAGNE: Could you give me an example of one mother and one son; one son who was in some way pulled into the orbit of extremism and they found their way to you? MONTAGNE: Because he was being paid. QADEEM: He was being paid. I said OK, now if we give you a good skill where you can earn a decent livelihood and you will be given protection and security and you can give the same to your family - because look at your mother, she's already like, you know, running for her life. So what we usually do, we train these people. We do a lot of psychosocial counseling and then we offer them some skills. And then we place them. MONTAGNE: When you say we place them, you place them into jobs. QADEEM: Yes. And now 79 of these boys - whom I will not say that they were all extremists like or they were in the hideouts or they were with the Taliban, but they were really much like, you know, under the influence of this idology and some of them really were working with some of the groups. Seventy-nine of them are transformed, they have been rehabilitated, they are reintegrated. So my plea here, is that there is way. So if the drones are stopped and the amount of money that is being spent on the drone can be converted into schools, hospitals and economic opportunities for everyone in that society and community, believe me, you will find people who will be transformed because we need to provide them alternatives. An alternative is missing. Army chief General Ashfaq Parvez Kayani inaugurated a US-funded road project in South Waziristan Agency on Monday — a move that may indicate easing of tensions between the estranged allies. The development is being seen as a significant one as the army chief has recently distanced himself from being associated with the Americans. Furthermore, Kayani inaugurated the Tank-Gomal-Wana Road amid reports that Washington had shown willingness to accept some of Islamabad’s demands, including an apology for last year’s Salala air strikes. A Pakistani official described the development as ‘positive’ saying despite recent hiccups in relations between the two countries, the US continued to fund important projects in the Federally Administered Tribal Areas (Fata). “The US is proud to partner with the government of Pakistan in rebuilding key roads and infrastructure in Fata,” said Karen Freeman, acting director of the US Agency for International Development (USAID) Mission in Pakistan. “We believe our joint efforts will bring commerce, jobs, trade and long-term security to this important region of Pakistan,” Freeman added. The road connects to the US-funded 110 kilometre Tank-Makin Road, which was completed earlier this year at Kaur. The road will provide the people of Murtaza Kot, Nilikatch, Gomal Zam, Tanai, Tiarza and Wana in the South Waziristan Agency access to Tank, DI Khan and other parts of Pakistan, a statement issued by the US Embassy said. USAID has contributed over $260 million for roads and other key infrastructure projects in Fata. Meanwhile, the army chief attempted to strike a delicate balance when he suggested the military was compelled to launch an operation against militants in Waziristan. However, after flushing out terrorists in the area, the army’s focus has now become centered on maintaining peace in the area by concentrating on rehabilitation and reconstruction activities, the army chief pointed out. In a meeting with tribal elders, Kayani insisted that no army wanted to fight within its own borders. “The army is concentrating on health and education facilities,” he added. He also inaugurated Spinkai Ragzai Cadet College and reviewed the security situation besides ongoing developmental work in South Waziristan. According to APP, Kayani said the army was deployed in the area on the demand of locals and would stay till the completion of development projects. The United States Agency for International Development will construct 200-kilometre roads in South and North Waziristan agencies in addition to undertaking longer term interventions in Khyber Pakhtunkhwa’s education and health sectors. Andrew Sisson, the agency’s mission director in Pakistan, told Dawn that the USAID had already constructed over 200km roads in South Waziristan and it was planning construction of additional 200km roads primarily in North Waziristan Agency and some in South Waziristan Agency. “It (road construction) is an excellent investment in opening the Federally Administered Tribal Areas in terms of economy and business to the rest of the country,” he said. The US agency, he said, had provided $201 million for roads linking North Waziristan and South Waziristan to the rest of Pakistan. He said that USAID was also planning to provide more resources for roads directly to the Fata Civil Secretariat later this year. Similarly, the USAID signed an agreement in October last year for disbursing funds for the construction of irrigation network downstream Gomal Zam dam that, he said, would irrigate 120,000 cultivable acres, benefiting thousands of farm families. Some $9 million for construction irrigation network, he said, had been released to the Water and Power Development Authority in December last. Mr Sisson said that investment in this part of Pakistan (KP and Fata), especially for education, health, infrastructure, community level activities, irrigation and business development, remained ‘a very high priority’ of the US government. “We are budgeting for the future..we are hopeful that the funds would come after approval by our Congress,” said Mr Sisson, adding that the Obama administration was committed to maintaining high level of aid to Pakistan even during this rocky period (of relationship). “Despite our relations, our aid levels are high,” he said, adding that his organisation would continue building schools in Fata and KP, which was a very important part of the bilateral relationship. He said that their assistance to Pakistan was in the interest of the people of both the countries and that it had been achieving great results. The USAID-funded projects, according to him, put 400MW to the grid last year, some 500MW would be added to the system next year, and one million children went to schools constructed by the agency over the past few years. “We want Pakistan to succeed, to be more stable and have a more prosperous economy,” he said, adding that their interest in Pakistan would continue no matter who was in power in the US. He said that apart from funding five major interventions in the energy sector the US was looking into making other investments to help Pakistan overcome its energy sector. “We are in discussion with the government for carrying out feasibility studies for Diamer-Bhasha dam,” said the USAID director. He said that some of the infrastructure projects were being carried out in tough regions where security formed a major impediment to the on time completion of projects. About corruption-free use of USAID funds, he said that except for two cases in which the USAID Office of Inspector General had collaborated with National Accountability Bureau, a majority of the projects had seen apt and honest use of funds. The government and local administration would take affective steps to maintain peace and for this purpose elders were also being taken into confidence, he added. During interaction with the elders and other segments of the society, Governor Masood Kausar said the government could not maintain peace and stability without the cooperation of local population. He said the government was serious to build schools and roads and provide better health and education facilities for which peace was a must and that could not be maintained without sincere support of all tribes. “Kurram Agency should be a role model for the rest of tribal agencies in Fata and it cannot be achieved without support of local people,” he said and warned that troublemakers would not be provided space to derail peace process in the area. During his visit to Parachinar Public School, Degree College for Women and Sports Complex, he said no efforts would be spared to impart quality education to the future builders of the nation and healthy activities like games would be encouraged. He announced provision of computers to the college and laboratory equipment to the school. He was informed that about 1,244 girls were enrolled in the college and 961 were studying at the school. However, the institutions were short of teaching staff which the governor promised to overcome. The girl students asked the governor to fill all vacant posts in the college and regularise contract teachers. He also laid foundation-stone for construction of a Polytechnic Institute and inspected its site and directed that work on the project be accelerated. The governor also inaugurated the new building of Parachinar Press Club and administered oath to its newly elected office-bearers. He was generous enough to announce Rs200,000 for the Press Club, Rs50,000 each for the winner and runner-up cricket teams at the sports complex and thousands more for the schoolchildren presenting PT show and other performances. The governor also held an open Katcheri to listen to the grievances of the people. Shahpar is a tactical canard pusher UAV that was developed by the Advance Engineering and Research Organisation, which is part of the state-owned Global Industrial & Defence Solutions (GIDS) conglomerate. It was revealed to the public for the first time during IDEAS2012, Pakistan’s biannual defense exhibition, in November last year. It was claimed to be an autonomous UAV with an endurance of seven hours and which could relay data in real time out to a range of 250 kilometers. Observers have said the Burraq appears to be a Pakistani variant or development of the Chinese Rainbow CH-3 UCAV, but little else is known beyond speculation based on the CH-3’s specifications. Reports that Pakistan was developing an armed UAV named Burraq date back to 2009. Analyst Usman Shabbir of the Pakistan Military Consortium think tank said he first became aware of the existence of the Burraq some years ago when it was still in the design stages with NESCOM. The two may be related, but he believes Burraq is armed and Shahpar unarmed. “Shahpar can carry about a 50-kilogram payload and has around eight hours endurance. Burraq, based on Chinese CH-3 specs, would carry around a 100-kilogram payload and 12 hours endurance,” he said. The given payload of the CH-3 is a pair of AR-1 missiles, or a pair of FT-5 small diameter bombs. The ability of Pakistan to field an armed UAV has great benefits when faced with time-sensitive targets, he said. “It is important in a sense that it greatly cuts the gap from detection to shoot,” he said. “The Army has been using German EMT Luna X-2000 and the British [Meggitt] Banshee UAVs, while PAF as we know has a lot of faith in the Italian [Selex] Falco,” he added. The Luna was also ordered by the Pakistan Navy in June 2012. WASHINGTON — While controversy swirls over reports that Pakistan may receive some of the excess Mine Resistant Ambush Protected vehicles that the United States has sitting in Afghanistan, American and Pakistani officials are on the verge of completing a deal to send new and excess MRAPs to Islamabad, sister publication Defense News has learned. The 160 vehicles, all of which would be the MaxxPro MRAP variant made by U.S. manufacturer Navistar, would be a mix of new builds and some from U.S. Army prepositioned stocks in Kuwait, according to a person familiar with the negotiations who is not authorized to speak for attribution. While no formal notification of the deal has yet been sent to Congress since the last stages of the vetting process are still being completed, the official expected a notification to head to Capitol Hill by the end of this month. The spat over the potential MRAP sale began in March when the Washington Post reported that the United States was considering giving Pakistan some MRAPs that the U.S. didn’t want to pay to ship home once the mission in Afghanistan draws to a close. The report came at the same time as Marine Gen. Joseph Dunford, commander of the coalition and U.S. Forces in Afghanistan, said there are more than 1,200 excess MRAPs in country. For a while, U.S. forces were literally shredding to bits the hulking MRAP infantry carriers that it doesn’t want to pay to bring home, but Dunford has since put a halt to that program while final decisions on the ultimate fate of the fleet are being made. The holdup on the deal for the 160 MRAPs centers around a congressionally mandated human rights vetting process that all U.S. foreign training and equipping programs must undergo. Known as the “Leahey Amendment” after the bill’s sponsor, Sen. Patrick Leahey of Vermont, the law stipulates that U.S. forces cannot train or equip foreign military or police units that have been accused of human rights abuses. The 160 MRAPs would be split among the branches of the Pakistani armed forces. Although specific army and air force units have been identified and vetted, the Pakistani Navy has yet to submit all of the required information, according to the official. While it hasn’t been reported previously, the Pakistani armed forces have already been supplied with 22 MRAPs — 20 MaxxPro’s along with two “haulers” to move them if damaged — under a now-canceled State Department program known as the Pakistan Counterinsurgency Capability Fund. The vehicles were drawn out of the U.S. Army’s existing stock in Kuwait. The fund was axed in the U.S. government’s fiscal 2014 budget. The State Department and the U.S. Embassy in Islamabad have been tying themselves in rhetorical knots over the past week trying to explain the situation over the potential MRAP transfer, all without giving specifics or mentioning the MRAPs already sent to Pakistan or the deal currently in the works. The State Department weighs EDA requests on a “case-by-case basis taking into consideration a range of factors including the need of potential recipients, regional security dynamics, how the recipient nations intend to use the equipment and the ability of an EDA recipient to sustain the equipment,” the embassy said. KHARIAN, Pakistan — Pakistan’s army is finally making significant gains in its campaign against Islamist militants, and some of the success can be traced back to unlikely sources: paintballs and bird calls. Here, tucked in a forest, Pakistan’s military has built a sprawling base to train soldiers in how to fight small groups of terrorists. The National Counterterrorism Center Pabbi is one of a half-dozen training sites in Pakistan, but military leaders say 65 percent of the troops fighting militants in the northwest have been trained at this facility in Punjab province. Earlier this month, the Pakistani military took The Washington Post on a rare public tour of the 2,500-acre facility, which opened in 2009 and resembles a hunting ranch on the scrublands of Texas. The training, which includes some un­or­tho­dox methods, is designed to make Pakistani troops more proficient in face-to-face combat. Although the troops have gained experience fighting in harsh terrain over the past few decades, they are still largely geared toward a tank-on-tank war with arch rival India. For years, U.S. lawmakers and generals have tried to get Pakistan’s military to shift its security posture to prioritize operations against Islamist militants sheltering in the country. To nudge it along, the Pentagon has given the Pakistani military $13 billion in reimbursements over the past 13 years for its counterterrorism efforts, according to a recent report by the Congressional Research Service. The State Department recently approved a $950 million arms sale to Pakistan, including 15 Viper helicopters, 1,000 Hellfire missiles and new radios. But Pakistani commanders and troops say the training conducted at the National Counterterrorism Center Pabbi is what is really allowing them to gain the upper hand against Islamist militants. Since the army launched a major operation in June, soldiers have cleared most of North Waziristan. They are now trying to drive the extremists from their final hiding places in the Tirah Valley, in adjoining Khyber Agency, commanders say. After years of casualties from insurgent ambushes, the military now sees the need for unconventional battle tactics. So soldiers also are learning how to conduct surprise offensive attacks. In one exercise, a soldier hides in a tree in what looks like a large nest. He has been taught a variety of bird calls, one of which he calls out when he sees a potential target. Then, under the tree, soldiers concealed in a small pit covered with sticks and grass climb out and begin shooting. “The terrorists don’t suspect us to use these tactics, so when we do, they are really badly trapped,” Ali said. Lt. Col. Kashif Amin, who leads a cavalry regiment of 44 tanks based in the eastern city of Lahore, brought 400 soldiers for the training because their tanks are of little operational use in rugged North Waziristan. “Especially for the younger soldiers, this is more challenging because they were trained for armored operations but will now be doing infantry,” Amin said.